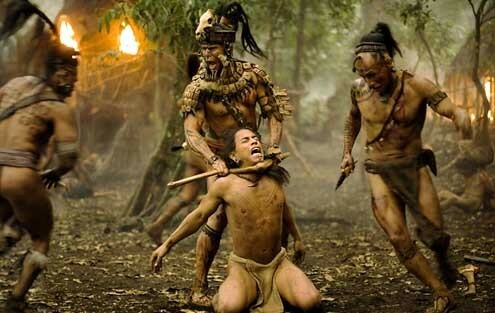 In Mel Gibson’s graphic movie “Apocalypto,” the viewer beholds an artistic take on the Mayan culture prior to 900 AD. In reviewing the facts portrayed in the movie one will discover there is some exaggeration and a mix of Mayan and Aztec cultures that have been melded together. Nevertheless, the movie shows what I believe lies at the core of the human experience. The cave man comes out of his cave and sees the big glowing ball of fire in the sky, and then how it descends at night. He works the land and see that he needs rain or water for the plants to grow, yet he also needs that glowing ball of fire. That ball of fire seems to be the most powerful thing in his world. The cave man plants some seeds and rain will not come. His family starts to starve, the cave man does not know what to do, the cave man asks the big glowing ball of fire to please hide itself and send rain. The cave man pleads with the ball of fire, saying I will do anything, please send rain. The next day it rains. The cave man sees his request has been granted, the big ball of fire, must be in control of all this…the cave man decides it must be his job to keep the big glowing ball of fire appeased, happy, maybe I shall give it something, maybe I should show the ball of fire that I noticed my request has been answered. Maybe if I can please this supreme being, my family will live? Maybe when there is no rain he is angry? Maybe if there is rain, I have done something to please this supreme power? So the journey begins, the quest to live at peace with the Universe. Humans have been trying to figure it out for a long time. Thinking that somehow we can appease the gods or the great powers that run this place. I believe this to be true, I believe that each human has a soul or a spirit and I believe at the center of all that we are, we long for PEACE. True peace, peace in all its fullness. We try to figure out what do do with the sickness of our soul everyday. We don’t feel good enough, we carry shame, we feel guilt, we want to resist pain and hurt, to bypass loss and death, and we cannot do it. And when you are a good person and try to treat others well and you work for your family and you still lose your son unexpectedly, you ask why? And you screw up and make a bad decision and you hate yourself for it and you cannot forgive yourself for this stupid decision you made, and you don’t know why? When you have been hurt by someone else and you feel it is so undeserved, and you don’t understand how someone could be so cruel? You look around and the darkness, the pain, the hurt of this place is so deep, so overshadowing, it all seems hopeless. We will drive ourselves crazy trying to figure it all out, what is fair, what is not, why this happens, why this doesn’t, the root of it all is there is an epidemic that has penetrated every human that walks the planet, it attacks everyone, it is no respecter of persons, it is the complete depravity of the soul. This is the problem, the maker, the inventor, the master mind, the creator of all things saw fit to fix it. It started with some rules and laws. Keep these Words and you can overcome this depravity, this immorality, this darkness, the rules didn’t work. He sent messengers, reminding people there is this solution to what you need it is found in the ONE, and the people would say “okay”, then in their times of hardship, they would want something more tangible, something they could see, something more than someone who simply revealed himself in WORD. “We need to make sure all our bases are covered, we need more security than this, this ONE. Two is better than one, they say, so maybe we need more help than just from this ONE. ” The epidemic was so strong, there needed to be an answer that provided a vaccine, a cure, a panacea. The soul of man could not find PEACE through laws and rules, it could not find peace through striving, through sacrificial systems, through good deeds, through war, through kings or judges. The soul of man needed THE Cure. This great power who had only identified himself as the ONE, the WORD, the I AM, had prepared a people group, a bloodline, to which he chose to use to enter this world. He then adorned himself in the dust of earth and came and lived here. And why? For what purpose would this great power leave His home and come to ours? He came to bring the cure. No more striving to be good enough, no more hating yourself, no more guilt, no more hopelessness, no more shame, no more fear, no more having to sustain yourself, no more hidden pain, no more would the depraved soul be master of our flesh. The cure has come! What the Mayans needed, what the Aztecs needed, what the Israelites needed, what the United States needs, what Africa needs, what Asia needs, what India needs, what my neighbor needs, what my family needs, what I need, we ALL need it, we all long for it, we could spend our whole life searching for it in all the wrong places. For this place we live offers generics. It comes in forms of ideology- just think right, self-help-just facilitate the right habits, psychology-just get some good therapy, education-just read this theory, enlightenment-just go learn to quiet your mind, humanism-you have the power in yourself to accomplish all you need, self-love- just love yourself and accept everyone and everything and we will all overcome. My dear readers, you cannot, you are not powerful enough to overcome the darkness in you without the ONE that makes darkness dissipate. He is the only way, he is the cure, he is the panacea. No one will ever find life, but through HIM. He is the Wholeness the Human Race seeks, he is The Prince of Peace. This is what I know. We have a choice, our soul can be eternally in distress or eternally at peace, we choose. Peace Has Spoken.